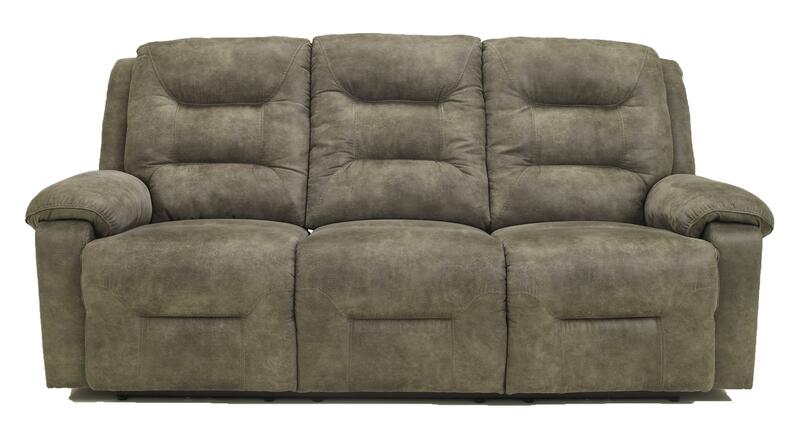 Enhance your home with relaxing comfort and a contemporary style by adding this reclining sofa. 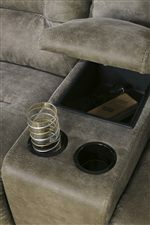 Divided back cushions and chaise style footrests are surrounded by stylish faux leather upholstery fabric. Thick pillow arms add to the cozy silhouette. 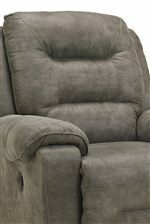 Recline easily with the manual reclining mechanism and adjust your seat to support your body for the utmost comfort. The Rotation - Smoke Contemporary Reclining Sofa with Chaise Style Leg Rests and Pillow Arms by Signature Design by Ashley at Miskelly Furniture in the Jackson, Pearl, Madison, Ridgeland, Flowood Mississippi area. Product availability may vary. Contact us for the most current availability on this product. The Rotation - Smoke collection is a great option if you are looking for Transitional furniture in the Jackson, Pearl, Madison, Ridgeland, Flowood Mississippi area. 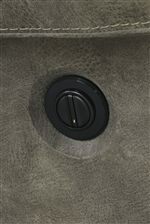 Browse other items in the Rotation - Smoke collection from Miskelly Furniture in the Jackson, Pearl, Madison, Ridgeland, Flowood Mississippi area.